I wrote in my last post about our integrated team of providers, our interest in lifestyle medicine and how all of this is designed to make you feel like you’re in charge. Like you belong not just to, but at Crossover Health. One of the backbones of how we provide care, build our relationships and help you belong is our technology. We don’t really give technology a second thought these days – whether it’s booking a restaurant, staying on top of what our friends are doing, grabbing a ride, taking care of our finances, the technology we use is simply a part of our lives. Except, it seems, in health care. Sure, there are fancy high-tech machines at doctors’ offices or at the hospital, but when it comes to tech that helps you and your care provider stay in touch, work together to solve a problem or simply make it easy to schedule an appointment, it’s just not there. It’s like you’ve stepped back in time. Not at Crossover Health. 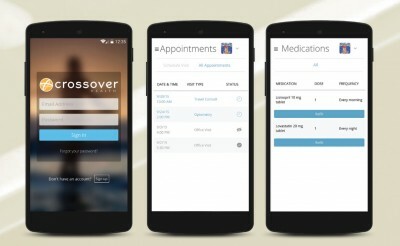 We want you to belong to Crossover and for Crossover to be a part of your life, so we have created technology and apps that keep you close, even when you’re not at the health center. Our GoCrossover mobile app, a big part of your membership, lets you schedule online and renew prescriptions, but is also where you can securely message your care team, get 24/7 access to one of our physicians and access really useful information. We’ll keep adding capabilities to it, as long as they help you stay informed and connected to us and your health. Membership means, in a way, a kind of ownership. We’re accountable to you and your health is, well, yours. Well, of course it is, you say…but health care seems to be stuck on the idea that you’re a visitor in your own care, especially when it comes to your health information. Our view is that your health record is yours, and with your permission and participation, we get to use it to help you. The electronic health record we’ve built is yours to share with us, not the other way around, which is why we look at the same screen in our consults. This is really important when you consider Lifestyle Medicine, which we discussed in our last post. We’ve designed our app so you can easily access your record, our visit notes and track your progress to a healthier you as you go through your daily routines. This is what owning your health can look like.